1st April 2018 marks a major change for Rights Holders and OTT broadcasters in the landscape of digital content delivery inside the EU. The new EU Content Portability rules oblige OTT broadcasters to change their geofencing rules to allow for conditional roaming access for EU subscribers within the EU. nScreenMedia’s whitepaper analyses the incoming EU cross-border portability measures and presents the likely impacts for the OTT industry. Complicating this significant re-writing of the rules in regard to territorial exclusivity in the EU is the technical challenges associated with confirming a user’s location when they stream OTT content. One in four internet users regularly uses a VPN to fake their location online SPECIFICALLY to circumvent poor OTT geofencing (rather than any privacy concerns) according to Global Web Index’s analysis in September 2017. 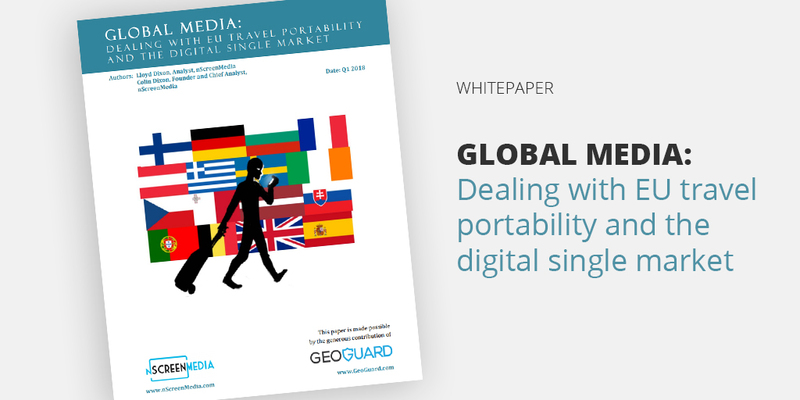 In addition, IP geolocation does not work at all for data-roaming customers in the EU and if the OTT platform offers enhanced geolocation from the device (GPS etc.) then the recent explosion in fake location apps and extensions offer a new generation of location spoofing tools for any non-tech savvy user looking to beat the system. One thing is for certain; the status quo for OTT geolocation in the EU is about to change materially with potential winners and losers across the value chain. Contact us for help in ensuring your systems and/or content will be ready and protected.